CK and I both eat a ton of yogurt in a variety of forms and flavors so when given the opportunity I jumped at the chance to taste test Olympus’s product line. When the shipment arrived I was bowled over by the variety of products the company made. There was the usual compliment of 0%, 2%, and full-fat Greek yogurt that we’ve come to expect, but upon further inspection I also discovered an array of fruit flavors as well. Blueberry, vanilla, peach, lemon, cherry, and strawberry to be exact, as well as my favorite type of yogurt — anything that comes with honey. I found the flavor of this new treat to be very rich and silky, and I’ll readily admit that this yogurt may actually kick my usual go-to brand to the curb. Yes, it’s really that good. 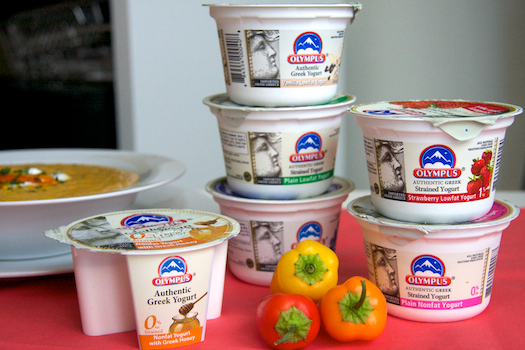 But Olympus isn’t only in the yogurt game, they also produce a line of cheeses made from sheep and goat milk. The cheeses that I tried have a nice tangy flavor and a good crumbly texture which makes them ideal to toss on top of salads and other summery dishes. Unfortunately, right now Olympus is only available in a few states but they will be expanding in the near future. To see if you can score some of this delicious snack in your hometown check out their website. The humans in my home weren’t the only ones who loved Olympus yogurt. Dexter quickly laid claim to the insulated box that the containers were shipped in and slept inside it on the kitchen counter all afternoon. I was extremely grateful for this distraction because he usually starts to go a little nutty around 3PM, and you haven’t truly experienced sheer terror until you have a 14 pound cat leap onto your shoulders from the floor while you’re trying to work at the computer. Meanwhile, after treating my cat wounds, I had a ton of yogurt to put to use and a recipe that called for that very ingredient. 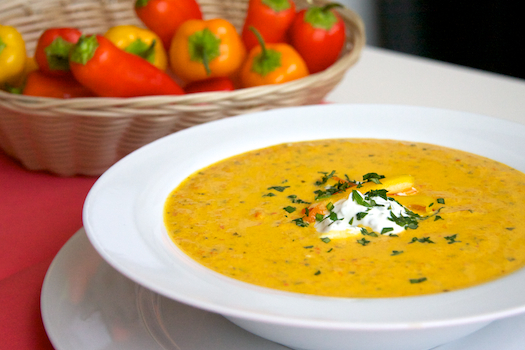 This roasted pepper and and yogurt soup is amazing! 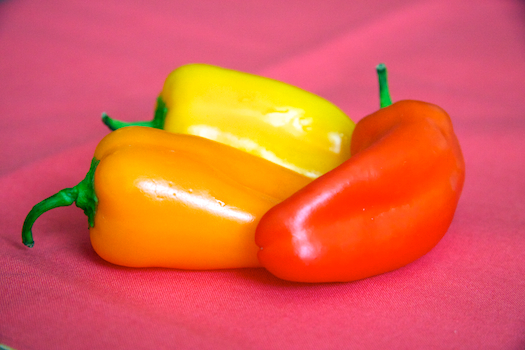 Roasting your own peppers at home takes a little extra time but it’s so worth the effort. Just don’t make the mistake that I did and use mini peppers. Oh yes, I peeled dozens and dozens of mini peppers simply because they were on sale and regular peppers at the grocery store that week were $1.50 each. That’s a lot, right? I’m not particularly clued in to prices but when you need almost 4 pounds of peppers you try your best to not spend $25 on them. I desperately need a neighbor with a green thumb to come into my life — one that gifts me bell peppers in the night like a culinary version of the tooth fairy. Hopefully you actually live in such a place! I really loved the flavor of this soup as well as the unique speckled appearance. The fresh herbs, especially the addition of tarragon, are to-die-for and the balsamic and white pepper give the dish a nice earthy note. One thing to keep in mind though is that greek yogurt is much thicker than plain yogurt so I’ve added chicken (or vegetable) stock as an optional ingredient to the recipe. If you find that the puree is too thick when you’re heating the soup on the stove simply whisk in a little of this liquid until you reach the consistency that works for you. 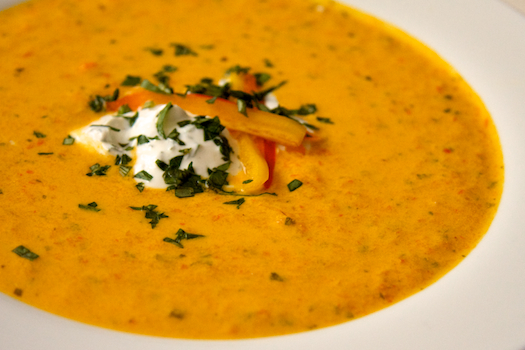 Optional: 1/2 to 1 cup of vegetable or chicken stock, especially if you decide to use Greek yogurt. Preheat the broiler and place the broiler rack as close to the heat as possible. Use aluminum foil to line a cookie sheet with sides. Place the peppers on the foil and broil them, turning them with tongs every few minutes until they are charred all over. Be careful not to break the skins. Remove the charred peppers to a large bowler bowls and let them cool. When the peppers are cool, place a colander over a large bowl. Peel the peppers, catching the peeled peppers in the colander and the juices in the bowl. Discard the seeds and blackened skins. Transfer the peppers and their juice to the bowl of a food processor fitted with the steel blade. Puree until smooth. Add the yogurt, chopped herbs, salt, white pepper, and vinegar. Process until blended. Pour the soup into a medium pot and heat on the stove over medium-low heat. If the mixture is too thick slowly whisk in chicken or vegetable stock until you reach the desired consistency. 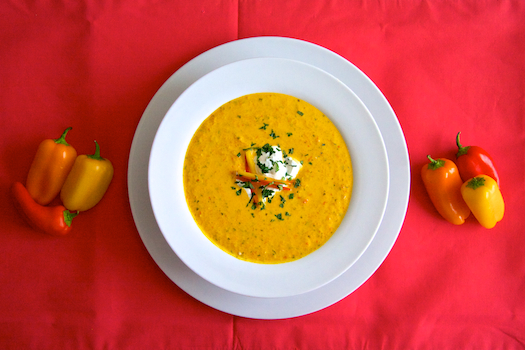 Serve in soup bowls and garnish with julienned peppers and additional yogurt mixed with finely chopped parsley, tarragon, and basil. Olympus products are really delicious.. I live in Greece, their original product place, and my daughter’s milk is Olympus. I am the only one in my family who likes peppers. I wish there were more, I’d make this all the time! This looks really simple and delicious! I love how you added some yogurt to make it nice and creamy! Previous post: Congratulations Kate & Amber!